No, this photo hasn't been photoshopped. The "ideal" Halter Horse today looks like its been inflated. This stallion is HYPP N/H, which means he carries the HYPP gene. The American Quarter Horse was the first breed that was developed in the U.S. The breed originated from Arabian, Turk and Barb breeds and was named for it’s ability to run a quarter of a mile faster than any other breed. An extremely versatile breed, they are known especially for their “cow sense”, their athleticism and their even temperament. 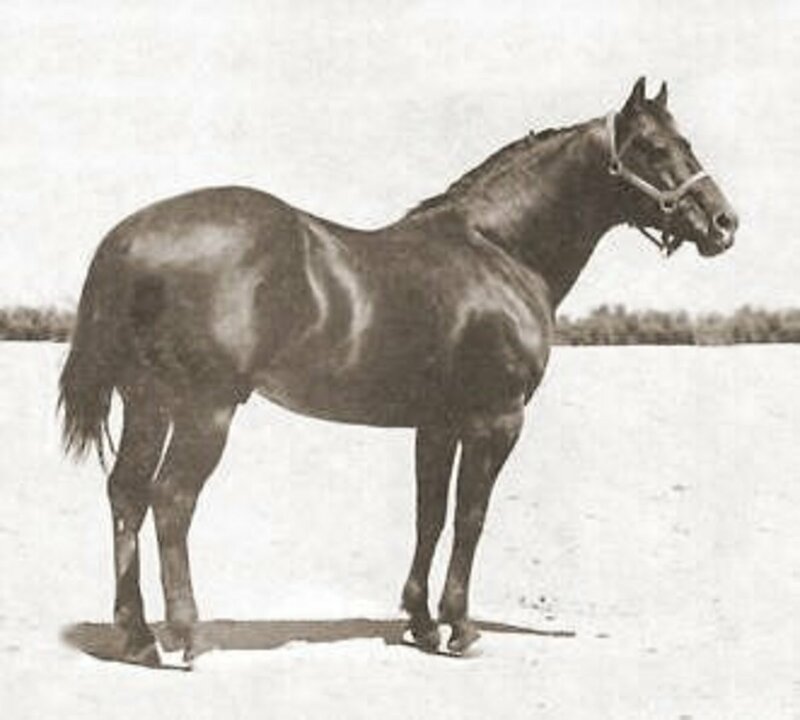 King P-234, born in 1932, was one of the foundation sires of the breed. He was muscular, but not absurdly so. So what happened? 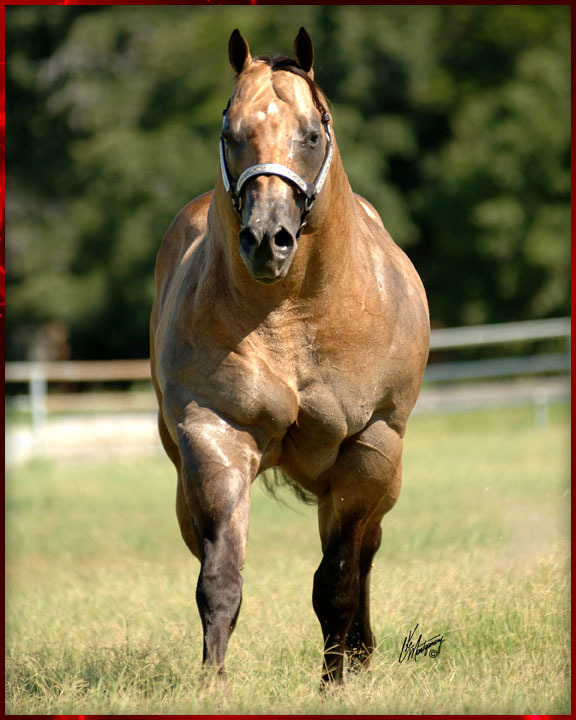 While some Quarter Horses still embody this ideal, there is a seemingly mutant strain that’s called the “Halter Horse.” These horses are so heavily muscled that they look inflated. They probably couldn’t run a quarter of a mile faster than I can, and they have a host of conformational and health problems. These horses are obese, tend toward having very straight (post) legs and fetlocks, and often carry the gene for Hyperkalemic periodic paralysis (HYPP), an inherited disease of the muscle which is caused by a genetic defect. 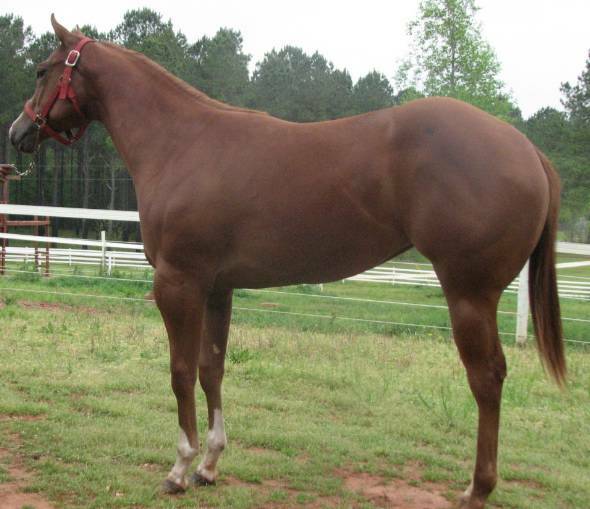 This filly has the straightest legs I've ever seen and you can just imagine how large her body will get. The stallion Impressive, foaled in 1969 is credited with starting the trend toward very heavily muscled Quarter Horses. Many of the Halter lines of QH today trace back to him. Unfortunately, he also was the foundation sire for HYPP. It was a genetic mutation started by Impressive that causes the disease. 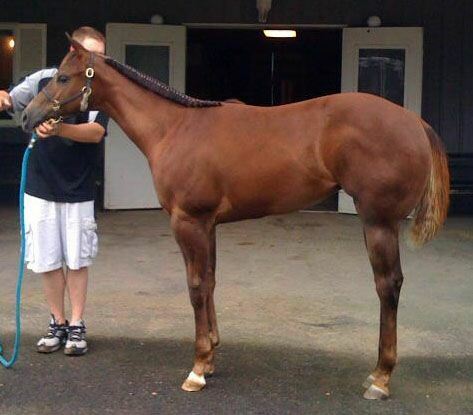 This 18 month old filly shows the muscling and "post" legs of many halter horses and carries the HYPP gene (she's N/H). Breeding an affected heterozygous horse (N/H) to an affected heterozygous horse (N/H) will result in approximately 50% carrying the defective gene (N/H), approximately 25% will be normal (N/N) and approximately 25% will be homozygous carriers (H/H). Breeding an affected heterozygous horse (N/H) to a normal horse (N/N) will result in approximately 50% normal offspring and approximately 50% carrying the defective gene (N/H). It is a crime that the AQHA has not wiped out this debilitating disease which could be eradicated by NOT breeding horses that carry the gene. I understand that some people use the halter style horse to add some bulk to performance horses. Certainly I understand that when you have a calf at the end of your rope it’s helpful to have a horse with some substance. But can’t this be accomplished without turning this classic American breed into a muscle bound, poorly conformed freak? Agreed! I have often wondered the same thing. It is frustrating to watch it happen. Impressive has passed his heavy muscling and defective gene into the Appaloosa world as well. Every generation that passes makes it that much more difficult to eradicate this disease. I guess it’s really no different than dog breeders that breed for type and end up with genetic disasters. Just a more concentrated, extremely OBVIOUS example. It’s so sickening, and a large part of why I chose NOT to get back into the breed show world after my time without horses. I had a 1981 AQHA/PHBA gelding who was in the top ten in halter as a yearling/two year old at the world show. He was tall and handsome, but athletic! He had the longer type of muscles rather than bunchy, and when I had him (at 9-15) he was sound and happy. And he could JUMP! Those were useful muscles, and he had a powerful hip, uphill balance, etc. We only jumped 4′ because I was too chicken to go higher, but it was super easy for him. Then again – by the time I bought him, he was already too “small” for a halter horse. Crazy! I think every individual involved in breeding horses with HYPP, including carriers, should be ashamed, and hope someday people get a clue. I’m completely out of the loop. Shocking. Stallion 1 looks like he’s been on a few to many anabolic steroid shots. (Not saying he is, just that he reminds me of photos of people that have been.) I’m not quite sure how a horse can develop that sideways bulge of muscle above the knee – on front legs – to such an extent without targeting them with weight lifting! The breeding of HYPP horses is nuts. Foundation sire looks plenty muscled. Dance muscles (agility) are what we need in working horses. If we look at football,the QB or receiver is muscled for max agility/strength, and the linemen for tank-ness. Which would we rather have in a performance horse? 18 mo old filly is scary looking. All that bulk on those itty bitty feet. Perhaps more frightening than seeing what is in the show ring is considering how many horses don’t make it there. Most halter horses grow too hard, too young. Notice the front legs on the 18 month old filly- they aren’t good enough for the show ring; she is over in the knees from all the wild muscle growth, and very likely lame. She might come out of it, or she might not. There is a reason that AQHA takes a pro-slaughter stance; what else would the breeders do with all these ‘rejects’? They certainly won’t be riding prospects if they flunk out of the halter world…. Honestly, I can’t decide which breed has suffered the most: the Quarter Horse or the Arabian. Halter QHs are so grotesque they look like rhinos and beef cattle, while halter Arabians resemble giraffes and seahorses, since they’re so LONG and stretchy, with overly exaggerated dished heads and snakey necks. If anyone wants an example, just look up Magnum Psyche, he is nothing like what a true Arabian should be. Both sides just go to such extremes it’s sickening. Of course, it’s not limited to horses, just look at the German Shepherd: they’ve been turned into frogs! Not only have these breeds deviated from their true forms, but they’re oftentimes unsound and not at all healthy. It’s outrageous and slanderous to promote these show/halter creations as what the breeds should be. YES! You are entirely right!! I hate the way people feel ok with slamming beautiful halter horses whom some of, have a hereditary disease that can be managed, and is percentage wise not that fatal, while many of the cutting horses and even some pleasure horses carry the HERDA gene, and nobody slams them for breeding! HERDA is 100% fatal! Give me a break! A halter horse is a walking conformational nightmare. Bad tiny feet and weak spindly bone to top it off. That is ignoring HYPP of course. Add that to your list of problems as well as being useless for what the breed was bred for and I would say that the halter horse should no longer be bred. I agree with you on HERDA. Horses with that should also not be bred. hears a thought if you have a horse that carries this gene then yes take care of it use what ever is needed to manage it so it can have a long life but do not use that horse for breeding in that the hose lives out his life as god planed and as it should but not allowing the gene to go any further no one is slamming a beautiful horse and no one wishes these horses that have the gene be killed but we do wish that if known that the horse has the gene don’t let it be passed on I mean no disrespect in what I say and like I said I agree to manage the ones that have it but let the gene die with them. I completely agree, I’m going to start showing my colt halter but he will not look like this… Like my mom said, “Halter is only a small portion of their lives, they need to be able to work as well, that is what Quarter Horses were founded on.” Quarters are supposed to be the breed that can look pretty in the arena, go run a race, and then go work cattle on the ranch. You can’t do that on very many halter horses now…. I think every breed has its own problems that people put into it! So it our fault! quarter horses are a heavy muslced horses are ready. impressive didn’t start this it was fulfilment a tb mare . My god father raised halter horses and race horses. we raise cow horses and we had some horses come out heavy muslced and they had no impressive. aqha horses are suppose to be heavy muslced and big hipped. but when we put three bars in the pedgree we screwed ower selves. because they can not hold up to like they use to. for example a joe handcock or a leo bred horse they where heavy muslced and pretty. but the halter horses got them to straight legged. to the point they cant walk. i hate to he these horses cause when you see them travel they cant . you can get the same out come of strength from a mustang instead of using this method. Im not saying that all that have this gene need to took out and shot but they do not need to be used for breeding methods what so ever let that gene live out its time and die off.It is not right to subject one of mans best and oldest friends to this just for the sake of a stronger ranch horse or a better show horse.Here I tell you what if this is how we are going to do things than lets subject are kids to steroids and in hopes for better and stronger humans for fighting in the army oooo not the same you say well it is you are taking one of gods most beautiful creations and destroying it little by little you might as well just take it out and shoot. I mean im all about improvement but at what cost are we willing to pay for this. I will breed mine to a stronger breed for strength I will feed mine with the right feeds and provide it with all the land it needs for a long and happy life. but I WILL NOT SUBJECT IT OR ANY OTHERS TO A LIFE OF OBESESTY AND HELTH PROBLEMS AND PAIN FOR THE SAKE OF THAT BETTER BREED. ????????? will you????????? Hi dear! I am currently writing a Problem Solution Paper for my English Comp 122 class, and it is on the use of anabolic steroids in halter horses / breeding with the HYPP strain. I would like to use your article as a source in my paper, but I read at the bottom that you would like to be notified before using any of your articles from your blog. I haven’t begun writing yet, I am currently just working on my annotated bibliography and I would like to put yours in as a source. I will be citing and crediting everything I use from you. Unfortunately, my annotated bib is due tonight at midnight, so I am going to put yours in. If you do not wish for me to use this, please let me know and I will try and find another source and not use it in my paper. Let me know soon! Thank you very much! Thank you for letting me know. You are welcome to reference this article with attribution. I remember Impressive. He was a remarkable horse and exceptionally prepotent, practically reproducing himself no matter what type of mare he was bred to. Then the rumors started. Owners of defective horses were starting to trace them to one horse. This was huge, and people demanded the AQHA step in. Finally, the test for HYPP was developed. It was assumed that NO ONE would breed their fine mares to an HYPP positive or even a horse carrying, yet not demonstrating the condition. It was also assumed back then that this genetic issue would be bred out in a few generations. So….what the HECK HAPPENED??? Why would people continue to bred animals that would keep HYPP a part of all the stock horses – AQHQ, Paints, Appaloosas? Good Grief!!!! I haven’t really looked at photos of these halter horses over the past few years. What I’m seeing now – well – there really aren’t any words… I see stick horses. Straight neck, head appearing to set on at an uncomfortable angle, no effective angle where the neck ties into the shoulder. Actually, there IS no tying into the shoulder. The neck is straight and just sort of stuck there, into an incredibly straight shoulder. The front legs — well, they’ve been bad for decades, and other than the continued tiny foot and straight pastern – it’s the same. The hindquarters? WHAT????? Have any of these breeders even heard of a gaskin? What did they do to get that long hip, and then have it somehow overhang the hock? How is this horse going to be able to move? Who thought Quarter Horses were supposed to have hind legs with no angles?????? Where did the hock go? STICK HORSES — with bulgy muscles stuck on like bubble gum. Why would anyone do this to a horse? Interesting article, but the QH was not even close to the first American breed. Both the Morgan and the Saddlebred predate the QH, and the Morgan was use to found both of those breeds. One specific Morgan off the top of my head…Yellow Jacket on the King Ranch in TX was actually the Morgan Jubilee King. The King ranch paid a pretty penny for him and used him heavily in their program. Great article, but I was just about about to write what Kathleen has written above, so kudos to her. If you want to know what the original “Quarter Horse” looked like, look at Working Western/Foundation-type Morgans – Jubilee King is perhaps the finest example. The QH did not emerge as a popular breed until the 1950’s, by which time the big non-industrialized ranching was done – and the horsepower had been – by and large – provided by America’s actual first horse breed – and QH progenitor – the Morgan. What you will find is a very balanced physique, well suited for about any discipline. America’s original stock horse type bears no resemblance to either the halter-type QH (which has become a bovine), nor the modern show-type Morgan (which has become a small Saddlebred – also largely descended from the Morgan). Both types have long since fallen victim to showring fashion du jour. The AQHA is becoming the laughing stock of organizations lately, they’ve gone so far as to now have a performance halter class added in. Not necessary as the breed is a performance horse. It’s unbelievable to me in logic. Having grown up working on a QH halter horse breeding farm during the Impressive Era, I can tell you that the worst part of Impressive was the heartless and relentless courtroom attacks on anyone who dared demonstrate that Impressive was the sole source of HYPP. First Amendment be damned, they’d come after you for saying the truth. If you saw what a truly bad case of HYPP did to horses, you’d understand. Rather than admit that Impressive was the carrier of the mutation, the syndicate sued breeders and scientists alike for telling the truth. I still cannot understand why there was such denial over Impressive and HYPP. It would be so easy to have eliminated the mutation and the fact that there are so many “workarounds” for treating HYPP (diet, etc.) when people know how potentially devastating it can be. Hard to find words to explain. It’s not even an attractive “look” for a horse.